"Why you pursue something is as important as what you pursue." Jake Gyllenhaal is wholly disturbing and convincingly mesmerizing as an opportunist, unemployed grifter turned late night videographer (aka "stringer") who lives on the fringes of society. Longtime screenwriter Dan Gilroy makes his directorial debut in this dark tale of the Los Angeles underworld. 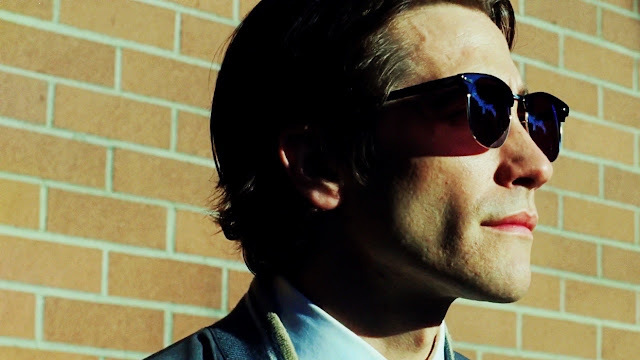 Nightcrawler successfully expresses different kinds of human desperation through self-motivation and aggression. Gyllenhaal's Louis Bloom (a contemporary Travis Bickle or Rupert Pupkin) is a scavenger with a warped understanding of human relationships and no ethics who capitalizes on self-help, opportunist nature of American society. He gives a revelatory performance with a mannered yet unhinged nature to the character. His directness and unnerving politeness are remarkably striking. His thin frame, dead gaze, and sleek demeanour give Lou an added layer of manic energy to his creepiness as he commits fully to his performance. The superb Rene Russo is just as disturbing (in a much more human way) as Lou's boss, a morning news show producer desperate for ratings. Of the many troubling scenes of depraved humanity, Russo and Gyllenhaal's strange conversation about the nature of news in a Mexican restaurant is haunting, using only words to get across the deprativity of the situation. Oscar-winning cinematographer Robert Elswit films Los Angeles at night with an eerie yet pulsing beauty, framing the streets with a mundane glamour juxtaposed with images of realistic violence to recreate amateur news footage and breaking news. This "nocturnal menace" makes the film play so well, creating a true sense of living outside conventional boundaries. Nightcrawler plays as a lurid, daring thriller and critique of contemporary media through Gyllenhaal's obsessively manic character portrayal. The film's pulpy subject matter shifts in its dark narrative, exploring the desperation and commitment to success while being disturbingly on point. Gilroy has fashioned a really captivating, precisely written and directed tale of Los Angeles culture after dark, capturing people on the edge of society, feeding off public curiosity about violence and crime. The acting was fantastic. Both Leo and Jonah Hill were a great team together. If you want to see Leo do a real tour-De-force performance, then by all means see this movie. Oscar-worthy central performance from Leonardo DiCaprio.